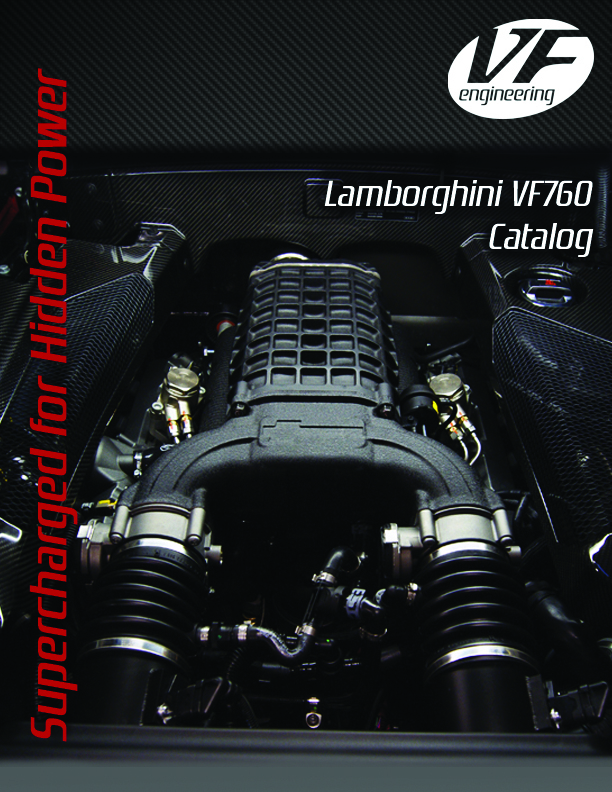 The Flagship product to emanate from the VF-Engineering R&D facility in Anaheim, California in 2011 is a bolt on roots supercharger system adding 200hp and 200lbs of torque to the V10 Gallardo (FSI engine). Available for 2009-14 models worldwide, this system uses the latest generation Eaton TVS2300 4-lobe roots supercharger with an air/water aftercooling system. Engine calibration is programmed with an ECU OBD2 port electronic flash/Direct flash and was designed by VF/Hex Tuning maintaining the Bosch safety functions and using the factory engine controls to re-calibrate for an enhanced combustion cycle. Extensive tuning of the camshaft timing mapping, allows appropriate charging of the combustion cylinders to produce an extra 120 ft/lbs of torque at 2000rpm.